It’s 2013 and we’re going back to the future with our street art take on the classic mix tape. It’s a combination of that old school hop with that new school hip! Although we have had to move with the times so we’ve gone and burned it on CD. 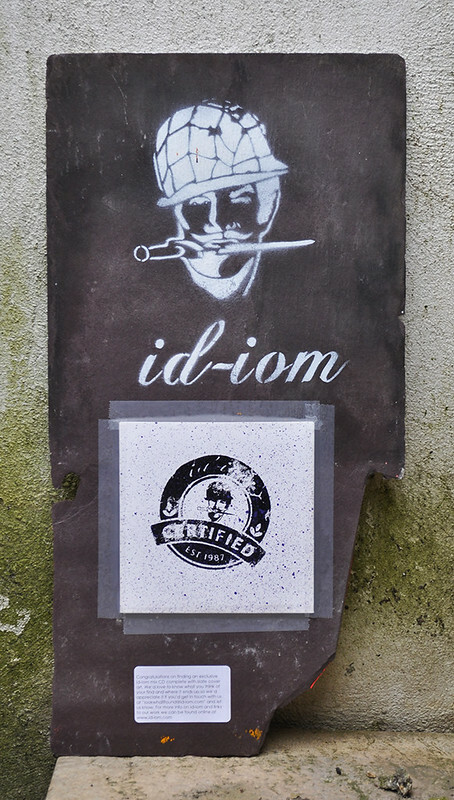 Both members of id-iom have been djing for more years than we care to remember and rather than go the inevitable route of uploading our mixes to Soundcloud and have no-one listen to it we’ve gone all experimental and attempted to fuse our street art activities and proclivity for making mix tapes. We’ve completed the hour long mix and then done the slate cover art to compliment the tunes. From there it’s just a matter of putting it on the street and seeing what happens. Only a very small number of copies exist and ideally we’re hoping that we’ll get a reply/critique/abuse via email from whoever found it and then hopefully they’ll upload it to the web and share it around for further praise/ridicule. Really we’re just too lazy to upload it ourselves and are hoping that someone else will do it for us. It looks better that way. So, if you see one of these suckers on the street feel free to take it home and then lambast us via email on our shoddy skills and poor tune selection. We are also now open to submissions – so if you dj at all and fancy taking part just get in touch and we’ll see what we can do. You can find more information on our facebook page here.